Designed for aeration / soil coring providing assistance with irrigation, seeding, de-compacting areas and to aid root growth. The clever yet simple design that makes this tool unique is the collection box, which catches all of the crumpling remnants that eject through the five 4 x 1/2 (100 x12.7mm) replaceable hollow tines, leaving no mess to clear up! The Corer Collector can be dis-assembled allowing for tine change (solid tines available), or to allow fewer tines in exceptionally compact ground. 5 Tine Corer Collector complete with Hollow Tines. in air and moisture, or for use when reseeding damaged or worn areas. Also ideal for use around the edge of compact sand bunkers. 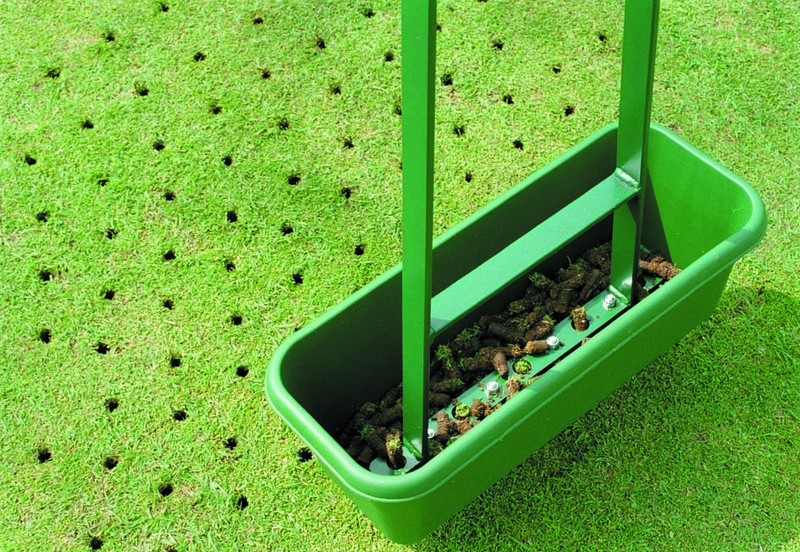 The Hedgehog is designed for use with localised aeration of fine turf, and for overseeding. Although the design of both tools are very similar they are both very well suited to completely different applications.